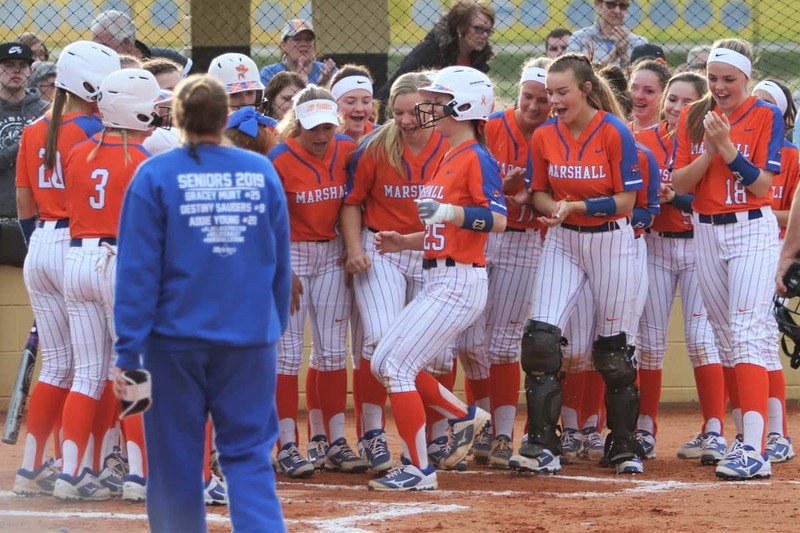 Gracey Murt’s teammates greet her at home plate following a 2-run home run in the third inning in the Lady Marshals 10-0 district win over Murray. The #15 Lady Marshals hosted #3 ranked Christian County Tuesday, a team that advanced to the elite eight round of last year’s state tournament. Christian County handed the Lady Marshals their first loss of the season by a final score of 6-4. Christian County led 3-0 in the top of the third inning, scoring on a 2-run home run by University of Kentucky commit Emmy Blane and a double by Rini Shemwell. The Lady Marshals put up two runs in the bottom of the third on a single by Gracey Murt and single by Riley Piercefield, then tied the game at 3-3 in the bottom of the fourth inning on a Layne Pea single. Christian County went up 5-3 in the top of the fifth on Blane’s second home run of the game and a double by Taylor Shemwell. A home run by Hope Jones put the Lady Colonels up 6-3 in the seventh, the Lady Marshals adding one run in the bottom of the inning but left two stranded with the final out. Hannah Sumner went the distance on the mound for Christian County to get the win, allowing 10 hits and four runs. Addie Young rounding third base, gets a high-five from Lady Marshals Head Coach Mallory Newton on her way to home plate after her solo home run against Murray. 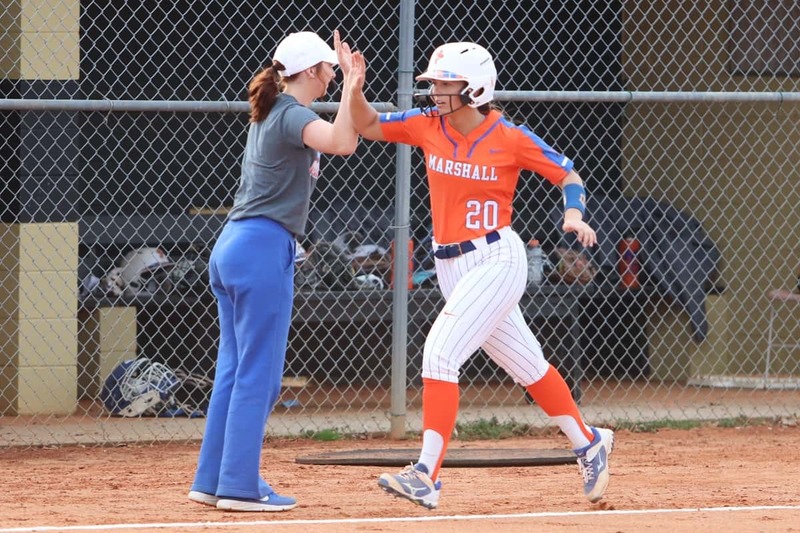 The Lady Marshals picked up their first district win of the season Thursday in five innings, defeating Murray 10-0 on 12 hits. After a scoreless first two innings, the Lady Marshals scored four runs in the top of the third on a single by Pursley, 2-run home run by Murt followed by a solo homer by Addie Young. They added one run in the top of the fourth on a single by Pea, putting the game away in the top of the fifth on a 2-run home run by McKenzie Elkins, Pursley ground ball, Murt triple and double by Young. Murt and Gabbi Lovett combined on the mound for the five-inning shutout, each allowing two hits. They were led at the plate by seniors Murt with a single, two doubles and a home run and Young with a double and home run. The Lady Marshals will head to Jacksonville, Fla. for Spring Break next week and will play against four top Florida teams. Monday they take on West Nassau, Tuesday they play Baker County, Wednesday they meet Mandarin and on Thursday play Creekside. 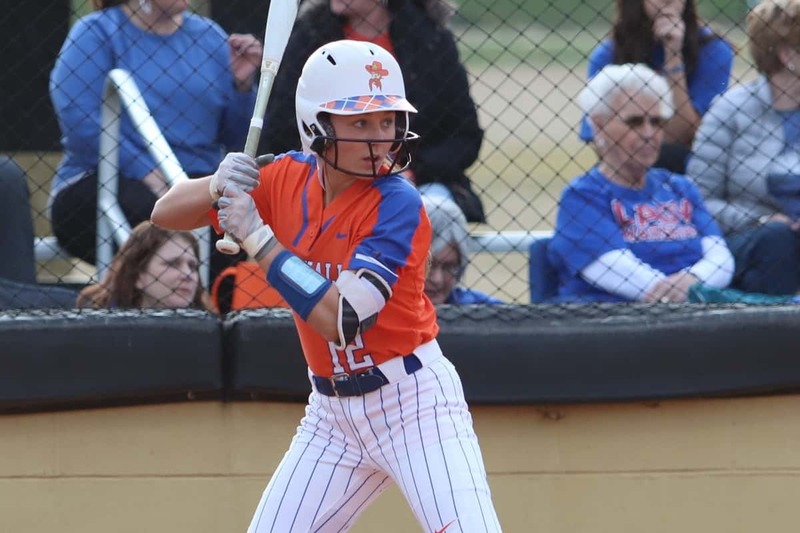 McKenzie Elkins hit home run number three for the Lady Marshals in the fifth inning in their 10-0 five-inning district win over Murray.